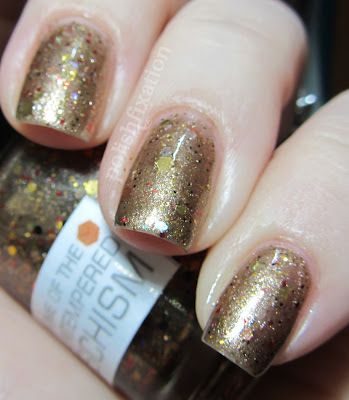 polish fixation: NerdLacquer: Home of the Untempered Schism! NerdLacquer: Home of the Untempered Schism! Guys! I can't tell you how excited I am to share this polish with you today! When I first heard about the indie polish brand NerdLacquer I was so intrigued by the idea of nerdyness + nail polish, because that is SO me! Then I saw that there were polishes themed after some of my favorite shows like Dr Who and Firefly/Serenity and I knew I had to have some of these polishes in my life! I finally was able to place an order recently and I went a little nuts! It was so worth it though! Today I am sharing the first of many NerdLacquer posts I will be doing! This one is one of the Dr. Who themed polishes, called Home of the Untempered Schism. ("a gap in the fabric of reality from which can be seen the whole of the Vortex". (DW: The Sound of Drums)"
Home of the Untempered Schism is a bronze colored base with a mix of all different colors and shapes of glitter and it's absolutely amazing! 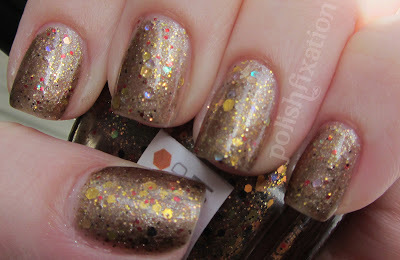 I love that the formula of this isn't like a typical chunky glitter. I used just 1 coat of Seche Vite top coat and this glitter felt completely smooth and laid down flat so nicely. 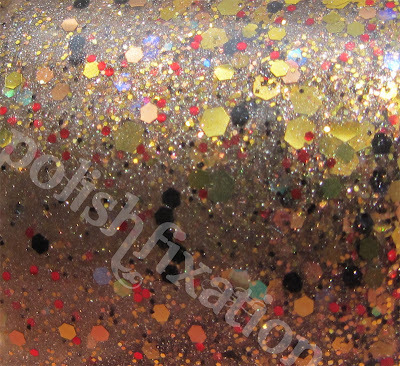 Here's a closeup of the glitter in the bottle. So amazing! So what do you think of this Nerdlacquer? Do you have any already? oooh those glitters are seriously pretty! Love NerdLacquer! I've got six mini-bottles in It's Just a Flesh Wound, Don't Panic, Exterminate, Holoday Mint, Crunchy Frog, and Don't Blink. The names and glitter mixtures are so original! Love love Nerd Lacquer! I have 10 bottles now and I have another 5 more on the way!